An NTC (Negative Temperature Coefficient) Thermister is used as Fire Sensor. Thermister is a kind of variable resistor and its resistance varies with the changes in temperature around it. 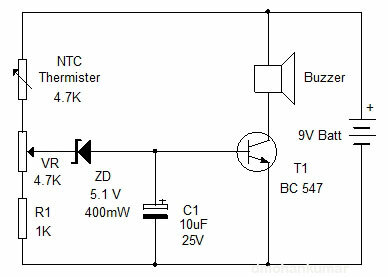 In NTC Thermister, the resistance decreases when the temperature increases. In PTC Thermister, its resistance increases when temperature increases. When the temperature is normal (as set by VR) Thermister has high resistance so Zener will not get break down voltage. So T1 will be off and Buzzer remains silent. When the Thermister detects Fire, its resistance decreases and Zener conducts. T1 then get base bias and turns on. Buzzer beeps till the Fire ceases. Use of Zener prevents false triggering of the circuit. That is, it conducts only when Thermister gives more than 5.1 volts when there is continuous fire. Set VR till buzzer just stop beeping at normal room temperature. Show a lighted match stick near the Thermistor. Buzzer will beep.